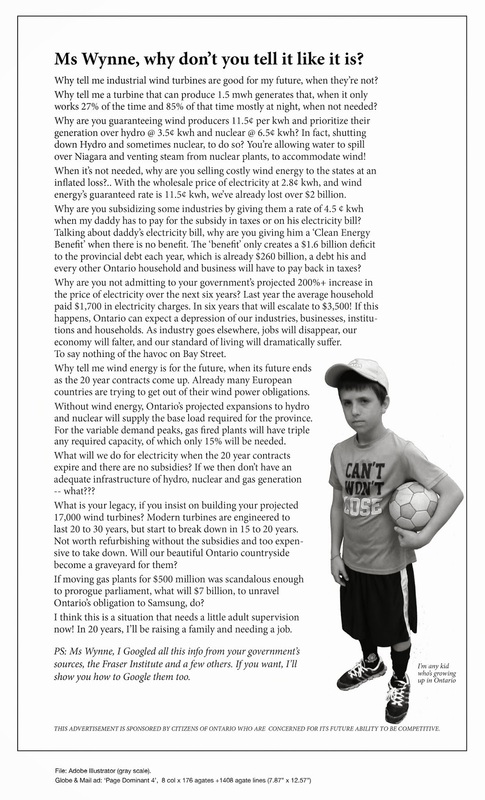 Heresy | Mothers Against Wind Turbines Inc.
To be sure, the $7 billion the Ontario government wants to spend in its latest plan to tackle climate change is a mere drop in the bucket. Auditor General Bonnie Lysyk last year tabulated the cost of the Ontario Liberals’ energy policies. She calculated that between 2006 and 2014, Ontarians paid $37 billion more for electricity than they should have. And, if left unchecked, we were likely to spend an additional $133 billion for electricity by 2032. Lysyk didn’t know that Kathleen Wynne’s Liberals were just warming up. In the aboutto- be-unleashed plan cooked up by Wynne, her Environment Minister, Glen Murray, and the folks they listen to, 12 per cent of us will be driving electric cars by 2025 (0.16 per cent of us are driving them now), and new homes will be heated by electricity. It will be the law. Nevermind that the electricity powering these cars and fossil-fuel free homes will continue to be generated by natural gas. After all, we continue to build massive gas-fired electricity generating facilities in Napanee and Sarnia. It is the press release that matters—not the facts. Automakers and large homebuilders already have their hands out. They know how this works. They have already signalled that accomplishing these goals will be a monumental challenge for them, and they are willing give it a shot, if, of course, it’s Wynne and Ontario taxpayers footing the bill. Pop-up businesses are emerging out of thin air to get in the way of the money—to snag contracts doing any number of silly and useless things. Few, if any, will achieve anything that measurably affects the Earth’s climate. But that misses the point altogether. To be clear, none of this is about sympathy for the planet. If it was, we wouldn’t use the legal might of the Ontario government to exterminate endangered turtles and bats that get in the way. We wouldn’t actively work to minimize the importance of their loss. We wouldn’t sanction the swatting of 300,000 of birds out of the sky each year. We wouldn’t industrialize raw and rugged land for useless, intermittent and expensive energy generation. And we wouldn’t work to bankrupt conservancy and nature groups and their donors seeking only to do what governments have failed to do. If it was about the planet we would care about such things. We would care about nature. Instead Ontario’s climate change policies are exclusively about appealing to the faithful. They are about exploiting the vulnerable. Those who have been psychologically badgered and beaten over the past decades with the catechism that they are the cause of the end of days—and only through repentance and rejection of self-indulgent lifestyles can they fix the Earth’s weather. Only through sacrifice can they achieve salvation. It is a seductive, effective and proven message. There is a generation coming of age that knows only this religion. It is all that is taught in Ontario schools. Countering views are held only by deniers, oil companies and other bad people. Blasphemers. The righteous are now able to look forward with optimism and satisfaction. Their day is nearly here. Leave aside the fact that humans have a persistent track record of doing the most odious things in defence of righteous conviction, let us look more narrowly at the road ahead. When the state decides it will choose who wins and who loses in its economy—it is always the individual who is most vulnerable. Big business and investors are far too agile. They will transform instantly into whatever shape makes them the most money. Besides, they’ve invested heavily into 90 Liberal fundraising events over the past two years to ensure the cash continues to flow their way. It isn’t necessary to get all worked up about this new energy policy that is being proposed. The Wynne government won’t be around to implement it. What people should concern themselves about is what will Patrick Brown and the Conservatives do when they take over. I believe it’s 2018 that Wynne & Murray will be done unless she pulls a Bob Rae and adds a year to it which she can.